In this age of intensified distraction, it’s hard to find time and space to concentrate on one specific thing to any significant degree. Yet if you want to be more productive, you need to focus, which requires both intention and discipline. Productivity means different things to different people, but we all know what we need and want to accomplish. It just seems we are often stymied in our attempts due to the hyper-connected world in which we live. The solution is to deliberately manage your attention. Even with the best of intentions, this combination of technology and environment make it difficult to focus on any given task. It should be no surprise then that the best way to manage our attention in order to concentrate is to first turn off all alerts (text, email, news, etc.) and create a quiet space where you won’t be interrupted. With regard to technology, this means mustering up the discipline and courage to deliberately turn off all those alerts on both your computer and cellphone. It also means resisting the urge to constantly check email, news sites and social media. I know FOMO (fear of missing out) is intense, but I suspect you are currently unable to accomplish all that you want. Isn’t that more important than knowing the constant status of your virtual friends and followers? If you work in an open office, this can be a challenge, but there are things you can do to make the best of it, such as using noise-cancelling headphones. You can also alert your colleagues of your intention to have “focus-time,” and that you would appreciate not being interrupted. Use a simple sign on your desk or cube to signal when you want this. Ultimately, it’s up to you to declare your intention and develop the discipline in order to deliberately manage your attention. According to Chris Bailey, author of Hyperfocus: How to be More Productive in a World of Distraction, directing your attention toward the most important object of your choosing—and then sustaining that attention—is the most consequential decision you will make throughout the day. Ultimately, you are what you pay attention to. Bailey calls this attentional space the amount of mental capacity you have available to focus on and process things in the moment. 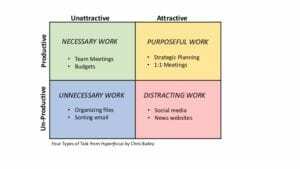 He suggests the most important way to begin is to divide your tasks into the quadrants below. The bulleted items are mine; yours may be entirely different. The Rule of Three: Everyday choose three things you want to accomplish by the end of the day. Keep these very visible, such as on a white board. You can also choose three things you’d like to accomplish each week. Most Consequential: Determine which of the three is most consequential by separating them into the four quadrants: necessary, purposeful, distracting and unnecessary. Out of the necessary and purposeful lists, which has the potential to set off a chain reaction? By following these intention-setting rules you will go a long way to accomplishing more because your intention drives your attention. When it comes to discipline, you will need to find the motivation to keep this method of operating present in your life. Take three weeks and implement it every day so it becomes a habit. Then reflect on whether this has made you more productive or not. Perhaps enlist your supervisor to provide his or her perspective and to keep you motivated and engaged. You will likely need to alter your current behavior and show up differently. And while your colleagues may at first mock or sneer at what they may perceive as “anti-social” behavior, they will ultimately respect you for your ability to provide the boundaries necessary in helping you bring your best self to the workplace environment. Be intentional about where you direct your attention so you can be more productive and reach more of your goals. On any given workday I find myself continually distracted because I’m multitasking—constantly switching from one task to another: writing an email while listening to the radio, answering a phone call while responding to a text, thinking about a particular client issue while the kids bicker in the background. It’s not unusual for me to have five browser windows open and I’m often reading three or more books at any given time. And, as someone who works out of a home office, there’s the dog, the doorbell, and various other interruptions. Little wonder it’s so difficult to remain focused on the task at hand. With the implied urgency of the text alert, the phone ringing, the dog barking, what is urgent has surpassed what is important. And that is a huge problem. Turns out it is possible to maintain focus if you can sort through what is important and urgent. Then decide what can be planned out, what can be delegated to others, and what can be dropped because it is neither urgent or important. “What is important is seldom urgent and what is urgent is seldom important,” according to President Dwight D. Eisenhower. This quote has evolved into what is called the Eisenhower Box. The most productive people I know and admire are not those who are super busy, but those who are super focused. Their ability to tune out the noise in order to concentrate on what is most important is truly remarkable and admirable. These are people who are disciplined to make the time and space for important and urgent things. They schedule when to do the important yet not necessarily urgent work and they follow up on it. They are willing and able to delegate that which is urgent, yet not important for them to do themselves. And they are people who eliminate tasks that are not important or urgent. Years ago I read Tim Ferriss’s book The 4-Hour Workweek. I also learned that multitasking actually prevents us from being truly productive. Nevertheless, it is rare that I make the time and clear the space for truly focused work. When I do, however, I am rewarded with the accomplishment of completing urgent and important things. This takes a great deal of discipline to maintain. No matter what you do for a living and who employs you, it is the important and urgent work where you need to focus your time and energy. To do this it’s necessary to filter out that which you can decide when to do later, delegate what others can do for you, and delete whatever is unnecessary because it is neither important or urgent. I recently put into place a plan for those things that are important yet not urgent such as responding to emails, writing blog posts and walking the dog. As an independent consultant, it’s a bit more difficult for me to delegate, nevertheless, I now enlist family and friends to share in the responsibility for urgent tasks in my personal life. These include shuttling the kids, shopping for and preparing meals, and planning trips. And I’ve dropped my Facebook account, greatly reduced my internet browsing, and refrained from obsessively consuming news. All of these have enabled me the time and space for work that is truly important and urgent. Of course, it takes discipline to maintain this and there’s a tendency to retreat back to other tasks because it can be very satisfying to be busy and to check off accomplishments. The important and urgent work is often harder. It’s like work that is strategic versus tactical. Strategy is much more important, yet less likely to be appreciated and satisfying because the results and rewards are not immediately apparent. Tactical work is more tangible and evident to ourselves and others. Delayed gratification is necessary for strategic work. If you want to be more productive, you need to first determine what things are important and urgent. Then by deciding, delegating and dropping the rest, you will find that you have created the time and space for the important and urgent work. 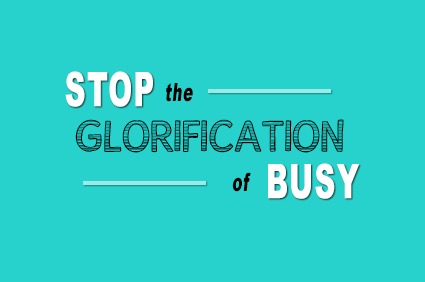 Stop being so busy that you are unable to focus on what is urgent and important in order to be most productive. There’s not enough time. Right? We’re all too busy in our personal and professional lives to squeeze in everything to make us feel happy and successful. But what is sucking away our precious time and how much control do we actually have over it? Turns out the answers are: 1) distractions and 2) a lot. I’ve been thinking a great deal about how to better maximize my time in order to accomplish more, reduce my stress, and increase my overall satisfaction in life. In this pursuit, I’ve read a couple of new books that help address this. McKeown suggests the way of the essentialist requires doing less and doing it better, so you can make the highest possible contribution in your personal and professional life. In Deep Work: Rules for Focused Success in a Distracted World, Cal Newport describes deep work as the ability to focus without distraction on a cognitively demanding task. It’s a skill that enables you to quickly master complicated information and produce better results in less time. Newport doesn’t argue that distraction is necessarily bad; instead he wants us to honor the massive benefits of focused attention. Work deeply – The trend of open floorplans to engage greater collaboration and serendipitous encounters is helpful only when it includes a hub-and-spoke model where individuals can seclude themselves or their teams in areas to focus for regular long periods of uninterrupted time as well. Embrace boredom – Structure your time to reduce multitasking and your addiction to the little dopamine hits from reacting to text messages, emails, phone calls, etc. Consider an Internet Sabbath or digital detox in order to recharge yourself regularly. Quit social media – When you analyze the benefits you receive from using social media, many of us will find it is not really supporting our long term goals for productivity and happiness. Isn’t this virtual form of connection more anti-social anyway? Drain the shallows – Reduce the amount of shallow work you are currently doing that is not essential. Email is a big component and needs to be managed more effectively. Non-essential meetings are wasteful to individuals and companies. Schedule your entire day into 30 minute blocks and stick to this routine to help you focus on what’s important and eliminate much of the shallow work. Now as a blogger who actively promotes this post via social media, I cannot justify fully quitting social media. However, I can choose to regulate how and when I interact with this tool. Simply calling social media a tool provides an important clarification regarding its overall value to me. As an independent consultant, I should have the ability to take control over my time. But I also want to be responsive to my clients’ needs, react to new client requests, and be able to shift my schedule in order to accommodate shifts by others. On the personal side, like many of you, I have the usual demands and desires with regards to my family and friends that often run counter to my efforts to control my time. Nevertheless, managing my time is entirely up to me and I can be successful if I choose to be intentional and disciplined. I suspect whether you work for yourself or someone else, you also have this opportunity to a large extent. Maintain my priorities. The health and well-being of me and my family comes first. All my work and activities stem from what helps support these, and this means I can then choose how and when to attend to everything else. Important and hard things first. I make time in the morning to work on the projects that require the most concentration and focus. I try to remove or delay distractions and less important tasks until later in the day. 90-minute timeframes for focused work. Much like the importance of complete REM cycles when sleeping, a minimum of 90 minutes is required in order to go deep into focused attention. Keep away from multitasking as it undermines focus. Take breaks to recharge. This can include the shallow work of writing and responding to emails and texts, taking phone calls as well as eating healthy meals, exercising, and chatting with co-workers. Reduce web surfing and social media. In this age of distraction, we have the choice to either rule over the tools at our disposal or let them rule us. Judge for yourself whether time on these activities is helping or harming your ability to reach long term success and happiness. Setting and maintaining boundaries. This is perhaps hardest for me as I want to say yes as often as possible. The trouble is I am undermining my effectiveness when I let people and projects permeate the important boundaries necessary for me to remain focused on one important thing at the expense of many other possibilities. The older I get the more precious time becomes. I want to make the most of it and therefore I choose to be more intentional and disciplined about my time. I hope you can too. In today’s workplace people are working harder than ever, yet the results may not reflect this in a way that shows increased productivity. Part of it may be due to a lack of focus on getting results. And part may be because bad habits keep us from succeeding. Getting results requires focusing on only that which matters. Self help author and motivational speaker Brian Tracy describes what he calls the “law of three” in business management. According to this law, aside from the three most important tasks or results you want to achieve, everything else contributes just 10 percent of actual results. Unfortunately, most people spend 90 perecent of their time on activities that contribute very little and then wonder why they are making so little progress. Tracy suggests you first determine the three most important results you must achieve in order to be successful. Typically, it’s one primary result with two supporting results that are essential in order to succeed in achieving the first. For example, the first could be sales volume, while the second and third would be effective marketing to attract qualified prospects and effective selling to convert prospects into customers. Next you need to eliminate all the “busy work” you end up doing each day that gets in the way of focusing all your time and energy on these three results 90 percent of the time. Take a critical look at your job description. Does it acurately reflect what the company needs you to do in order to succeed in your three most important results? If not, see if you can refine it and then present this to your manager. You are not looking to be confrontational, but you want to ensure your time and energy is used to produce results the company wants and needs from you. The other side of the equation has to do with your own bad habits that may get in the way of reaching results. This is where you have to take an honest appraisal of yourself and identify what you do habitually that keeps you from staying focused on your three results. If you can increase your good habits and reduce your bad habits, you will dramatically contribute to your success in life. This is easier said than done, of course. There is a saying that bad habits are like comfortable chairs—easy to get into, but hard to get out of. 1. Make a Plan – Write this down; make the bad habit specific and describe what it looks and feels like to be gone. 2. One at a Time – As tempting as it may be to take on more than one, stay focused so you can be successful with just one habit at a time. 3. Take a Full 30 Days – There is no research to say exactly how long it takes to break a bad habit, but if this is something you do all the time then 30 days should be sufficient. 4. Acknowledge Your Triggers – You know better than anyone what triggers your bad habit, so you must determine a strategy to avoid or counter them. And for each trigger, determine a good habit you can use in place of your bad habit. 5. Avoid Environments/People That Trigger You – If there is a place or person that makes this habit more likely to show up, see if you can avoid it or them for awhile. 6. Acknowledge Your Obstacles – You also know what gets in the way of changing your behavior better than anyone. So think of a creative strategy to overcome them. 7. Ask for Help and Support – Don’t go about this without others to cheer you on and help you when you are weak. 8. Become Aware of What You Tell Yourself – All too often what we say to ourselves can counter what we try to achieve. Be mindful of this inner dialogue and correct it if necessary. 9. Stay Healthy – Take care of your physical health by eating a healthy diet, getting regular exercise and plenty of sleep. 10. Determine Disincentives for Failure – Make failing to change this habit detrimental in some way that will help you succeed. 11. Give Yourself a Reward – Acknowledge and celebrate your success with a reward that will continually remind you of why you earned it. 12. If you Fail, Start Again – Like learning anything new, it may take more than one attempt to succeed. Don’t get discouraged, find out what went wrong, correct it, and start over again. Bad habits can often sabotage your attempt to focus on the most important work at hand. It takes courage and commitment to remove these bad habits, but once you do, you will be rewarded for a lifetime. This combination of focused attention on your three most important results and removing habits that get in the way of succeeding are the keys to making your hard work lead to increased productivity.